What does the Office of the University Secretary do? What types of events does the Office of the University Secretary organize? The Office manages key institutional and ceremonial programs including Commencement, Convocation and Presidential Inaugurations . What is the history and meaning of Penn's seal? 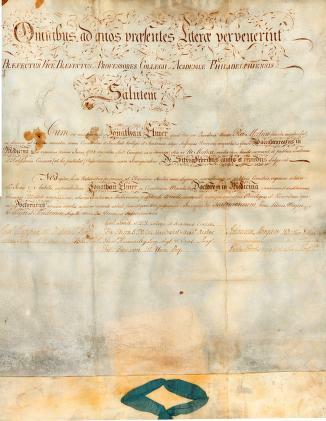 The Trustees of the University of Pennsylvania have an official seal that is, in effect, the signature of the corporation. It had its origin at a meeting of the Board of Trustees in 1755 with Benjamin Franklin as Chairman. Though the seal underwent changes over the years, the most recent design, approved in 1932 and adopted in 1933, returned it to virtually its original form. The seal is composed of seven books stacked on a slanted desk top with the books bearing the following titles, representing the curriculum of the day, in the order from top to bottom: Theolog, Astronom, Philosoph, Mathemat, Logica, Rhetorica, Grammatica. On the periphery of the stack of books appears the University motto Leges Sine Moribus Vanae and the whole is encircled with the inscription Universitas Pennsylvaniensis. What is the history and meaning of Penn's shield? The Penn coat-of-arms was derived by combining the coat-of-arms of Benjamin Franklin and that of William Penn's family. The dolphin on the red chief was part of Franklin's coat-of-arms and the three silver plates on the blue chevron were part of Penn's. The two were combined on a white shield along with two open volumes representing the University's educational purpose. What is the history and meaning of Penn's motto? The motto of the University, Leges Sine Moribus Vanae, means "Laws without morals are useless (in vain)." It comes from the longer quotation from Horace, "Quid leges sine moribus vanae proficient" the sense of which is "of what avail are empty laws without (good) morals." What is the history and meaning of Penn's colors? Eighteenth century American academic institutions did not have colors. The earliest known representation of the combined Penn colors, red and blue, is based on the incised lid of the 1871 College Hall corner stone. One legend traces their origin to an early track meet at Saratoga, New York, between Penn, Harvard, and Yale. When asked by the officials what colors would be representing the Penn team, the captain reportedly replied, "We're going to be wearing the colors of the teams we beat," i.e. Harvard Crimson and Yale Blue. We shall assume that Penn was victorious and thus remained loyal to the red and blue. What does the University mace represent? What is its history? How big is it? The University Mace, the symbol of authority of the University, is carried by the Vice President & University Secretary. It was a gift of the family of William Murray Gordon, M.D. 1910. The Mace is adorned with the seal and arms of the University, the William Penn and Benjamin Franklin family coats-of-arms, a depiction of the Rittenhouse Orrery, and a thistle symbolizing the early ties of the University with the University of Edinburgh in Scotland. The University Mace is exhibited in the display cases on the main floor of College Hall. It weighs 4 pounds and is 3 feet 4 inches long. Who has the "right" to use Penn's name and insignia? Please visit Use of University Name. Who are the trustees of the University of Pennsylvania? Formal institutional governance and fiduciary responsibility for the University of Pennsylvania rest solely with its Board of Trustees. The trustees delegate the responsibility for the day-to-day management of the University of Pennsylvania to the administration and, in particular, to the president. For this reason, one of the most important responsibilities of the trustees is the selection, retention, and replacement of the president. The trustees, however, seek to support and reinforce the administration in several ways. They serve as a bridge between the University and the world; on the one hand, interpreting the institution to the public, and on the other hand, bringing in experience and perceptions gained outside the University. The trustees provide leadership in the identification and development of financial resources. They oversee the University's relations with other institutions, the private sector, government bodies, and the media. In consultation with the president, the trustees determine the long-range allocation of resources, making decisions in the context of the needs and expectations of the University's constituencies and of society. For a current roster, go to the Trustees. 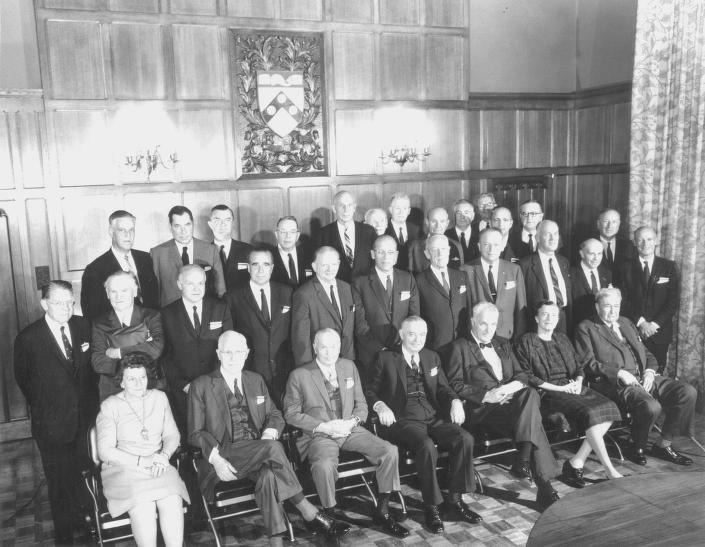 Pictured below, The University Trustees circa 1965. Trustees are chosen in one of three ways, depending on what class of Trustee they are. Term Trustees are selected by the Nominating Committee of the Trustees and elected at a Stated Meeting. Alumni Trustees are elected by the alumni in accordance with rules established by Penn Alumni. Commonwealth Trustees are four non-elected officials appointed by the following representatives of the Pennsylvania General Assembly: President Pro Tempore of the Senate, the Minority Leader of the Senate, the Speaker of the House of Representatives, and the Minority Leader of the House of Representatives. When are the next trustee meetings? Please go to the trustee meeting schedule. Do you have meeting times for the next trustee meetings? If it's within 30 days, we should have the schedule set. Please go to open meeting times. Most meetings are open to anyone, but certain ones are closed. It varies from meeting to meeting. Please go to the open meeting schedule. Overseers are members of the advisory body to the dean of a school or the director of a major University unit. Please view the current rosters of the Overseer Boards by Centers and Overseer Boards by Schools. There are approximately 500 Overseers at Penn, the majority of whom are Penn alumni. What does an Overseer do? Overseers are appointed by the Trustees of the University and serve a three-year renewable term (not to exceed three terms, unless in special circumstances). At Penn, Overseers provide long- and short-term advice to deans and directors regarding the achievement of strategic objectives and priorities. Overseer boards serve as bridges between Penn's schools and centers and the community beyond campus boundaries. Although Overseers do not have fiduciary responsibility, the President, Provost and Board of Trustees rely heavily on these boards to help inform the work of the schools and centers. How does one get to be an Overseer? Power of appointment to the Boards of Overseers rests with the Trustees of the University, who act upon recommendations by the President and the Chair of the Trustees. Nominations are submitted to the Office of the University Secretary primarily through the schools and centers. Typically, a person nominated to serve as an Overseer has had a long-standing relationship with the school or center, providing philanthropic support, professional expertise, and serving as an ambassador to the general public. Upcoming Commencement dates can be viewed on the Penn Academic Calendar. Commencement is scheduled 3 years in advance, so dates beyond those on the calendar are not yet available. Please note that the schedule of individual school cermonies is not on the calendar and is generally not known until March of that year. Why is the University Commencement ceremony on a Monday? We have been following the Monday schedule for many years and have determined that it works best for the University and the majority of the faculty, staff, students and parents. In 2000 we revisited the possibility of moving the ceremony to Sunday, but determined that a change would negatively impact the individual school graduation ceremonies, as well as the Baccalaureate ceremony. How many graduates are there each May? Who is permitted to wear the "Red & Blue" gown? The President of the University and other administrative associates may wear the "Red & Blue" gown, as may holders of a Penn doctorate level degree. The University issues diplomas three times per year: May, August and December. You should receive your diploma, via U.S. Postal Service, approximately two months after you graduate. Pictured: Doctor of Medicine, circa 1771. Collection of the University Archives and Records Center. Will you frame the diploma for me? Our office does not frame diplomas. Please refer to the Penn Book store: (215) 898-7595. What is the size of the diploma? The size of the diploma is 9 5/8 inches by 12 1/4 inches. In what language is my diploma? The TEXT of the diploma is written in Latin and has been since the founding of the University. Can I have my diploma printed in my native language? No, we do not print diplomas in any language other than Latin. However, an English translation of the diploma should have been enclosed when it was mailed to you. If for legal reason, you require a certified translation of the diploma, you can order one from the Office of the University Secretary by following the procedure for diploma translation. Does Penn keep copies of the diplomas on file? No, the University of Pennsylvania does not keep copies of diplomas. You can order a duplicate or replacement diploma by following the diploma replacement procedure. How long will it take to receive my duplicate diploma? You should receive your duplicate diploma within 8 to 12 weeks. Can I rush my diploma order? Yes, but additional charges apply. Can you express ship my diploma to me? I want to surprise a loved one with a duplicate diploma. Is it possible for me to order one without the Penn grad's knowledge? No, for legal reasons we can't issue duplicate diplomas to anyone but the graduate. Can you send me a pdf of my diploma? No, Penn does not distribute diplomas in electronic format. To get information on Apostilles please visit the Diplomas web page. May I nominate someone for an honorary degree? Anyone can be nominated for an honorary degree. To submit a candidate for consideration you may fill out the nomination form. Please explaining why the individual deserves an honorary degree and include any helpful background. Who have received honorary degrees from Penn in the past? Please go to the list of past honorary degree recipients. Has Penn given an Honorary Degree to Benjamin Franklin? Yes, Ben Franklin was granted a posthumous Ph.N.D. in 1976. Pictured: General George Washington, Honorary LL.D. 1783. How do I get involved with a University Council Committee? Members of University Council Committees are selected by each individual constituent group, namely the Faculty Senate, the Undergraduate Assembly, the Graduate and Professional Student Association, the Weekly-Paid Professional Staff Association, and the Penn Professional Staff Assembly. Are all University Council meetings open to the public? The monthly meetings of University Council are open to the public. If you would like to attend please register with the Office of the University Secretary via ucouncil@pobox.upenn.edu or telephone, (215) 898-7005. Visit the memorial page for Sheldon Hackney. Visit the memorial page for Martin Meyerson.